Glenn Howarth was an innovator and artist very interested in process: he began working with tondo-shaped canvases, was an accomplished portraitist, and moved into computer graphic art in the early 80s. The way that he approached his computer work especially highlights an ongoing fascination with the layering of works and the process by which they come together. He applied the same stage-by-stage process to his painting by producing a seemingly abstract composition that would reveal itself at the last brushstroke. He sought to achieve this revelation of image through vibrant and sometimes garish colour relationships. 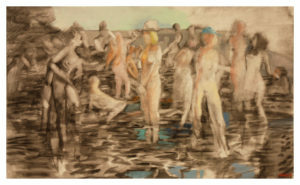 Wreck Beach #9 (unfinished work), 1995, Gift of the Estate of Michael C. Williams.